There is no such a thing as a terrorist attack where lives are not seriously at risk. The prevalence of these types of attacks whether from 'home grown' terrorists or from external sources is increasing and will likely to do so for the foreseeable future here in the United Kingdom. While security has never been higher, neither has the terrorism threat where frequently the governmental bodies state that we are on a 'critical' alert state. In schools, academies and universities that threat from a terrorist attack is always there in the background and could easily be maybe forgotten. Unfortunately, the very people responsible for protecting pupils and students are not actually terrorism prevention officers but more likely staff, many of which are not likely have been in a terrorist attack historically. 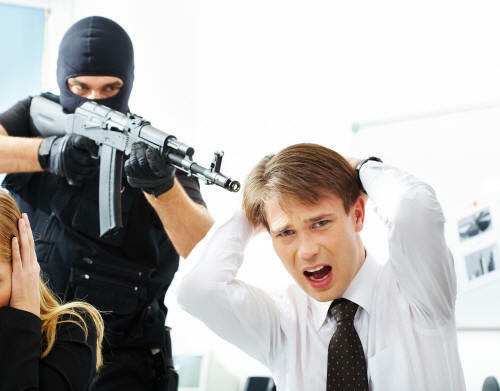 The training of staff for ANY dynamic lockdown situation is critical let alone a terrorist lock-down. While some terrorist attacks are (needless to say) very carefully planned, others are less so, but it is the responsibility of the lockdown procedures and staff to ensure that these procedures work effectively every single time. Carrying out continual planned lockdown practice is essential to ensure that the procedures you have in place will actually work in practice and not just on paper. Of course, no amount of planning could ever foil a terrorist attack or keep people safe if the communications that your procedures depend on are in some way compromised. It's essential that everything you depend on in this important area really is capable of operating flawlessly while staff are under incredible stress from the lockdown in any real situation. Faced with a situation even remotely like that in the above image it is easy to see that staying calm, understanding procedures and being able to communicate are all very essential aspects in arriving at a successful outcome from that situation or indeed any other remotely similar threat to human life. Bear in mind the 'Stay safe' film provided by NaCTSO and NPCC which advises actions that people should take in the event of a firearms or weapons attack. See our page about NaCTSO and NPCC guidance here. Our company has a number of products based on different technologies that can help you achieve a successful lockdown based on effective communications between the people that are involved in the lock-down situation. We have been making communications systems since 1993 and our products are used worldwide in many sectors of business including health and safety, hospitals, schools, universities and many other sectors.